This was such a nice gift and I really wanted to thank Amanda for it, so I made her a card. I used the houndstooth embossing folder to emboss the white card and then I used the pink stamp pad to ink the raised areas of the houndstooth to give the card dimension. I used the Mini-Monograms cartridge for the sentiment and used the shadow feature. I wanted to add a little bit of bling without going overboard, so I added the Prima flower with the Making Memories Sabrina Blossom behind it and attached them both with a silver brad. I added a strip of light pink ribbon to the very top of the card because after I embossed the card there was a very small area that remained un-embossed and it made the card look off balance. Plus...it never hurts to add a little bit of ribbon! Hope you like the card, below is the list of materials that I used to create it. Offray Ribbon, Light Pink, 1/8"
There are some awesome projects and great blog candy too! A New Grandbaby to Love & Spoil! I'm very excited to announce the arrival of our 4th Grandchild...Baby C, born on Thursday, March 23rd at 9:30 am! She weighs 6 lbs. 9 oz. and is 19-1/4" long. I don't think I have to mention that she is absolutely GORGEOUS!! We are beyond thrilled and feel so blessed to have her! Hopefully I will have some cute scrapbooking layouts up soon featuring her and her big Sister B. Thanks for checking in...Hope to have you visit here again soon! 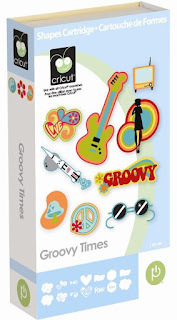 Hey there fellow crafters...just wanted to share with you some great deals I got on Crictu Cartridges at OhMyCrafts.com. Please excuse my un-refined video style...I'm pretty new to this and it takes some getting used to. I still haven't got the lighting quite right or the audio, but I'm working on it. Thanks for bearing with me and thanks for watching! Come back and visit me soon! Okay, so you might be wondering what the title of this post is supposed to mean...well I have been experimenting lately with a lot of different crafting techniques and one of my favorite craft designer's is Tim Holtz. So, I have been wanting to try some of his distressing techniques on my card making endeavors. I don't know that I am very happy with how this card turned out though. For some reason when I "distress" something...it just puts me in DISTRESS! LOL! It never looks like Tim's stuff...it just tends to look like my cat spilled some of my art materials all over the table and it leaked onto my card! I anguished over whether I should post it here or not, because I don't want to be embarrassed, but I have to learn, so I figured I'd post it and maybe some of my talented crafty friends and followers out there can give me some suggestions on how to make it better. It kind of makes the card look less...uhmmm...scary, shall we say?! One of the problems I seem to have is that after distressing the item it gets warped and wrinkled, even if I dry it with my heat tool. I had to lay a big heavy piece of marble tile on top of this card overnight, just to make it lay down flat! It's still not perfect as you can plainly see in the photo, but I'm hoping it's acceptable because I was hoping to send this out to a fellow blogger who's blog candy I won awhile back. I just have to move on and consider this a learning experience, but I get so frustrated when something doesn't turn out the way I had envisioned it. I'm no Tim Holtz for sure...maybe I should try to take one of his classes and gain some confidence in this technique. I watched some of his videos and thought I had a good idea on how to do it, but clearly that is not the case. Is it good enough to send to a friend to say "Thank-You", or is it just too darn messed up? BTW...in case you are wondering what the heck I did with the Copic Marker in this project, I actually colored the polyester white ribbon with it! I never would have thought of doing this until I saw a great tip posted by my Crafty Blog Friend, Joy at www.Joyslife.com. Fantastic Follower Giveaway!! Stork's Delivery Cricut Cartridge!! Amy at Love to Crop is giving away some great blog candy for reaching 100 followers! Check it out, the giveaway is going on until March 28th. You don't want to miss this one, this Cartridge (Stork's Delivery) cannot be bought just anywhere, it is exclusive to Creative Memories and has just been released! 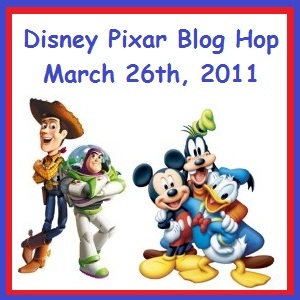 St. Patty's Day Blog Hop Fun & Awesome Blog Candy! 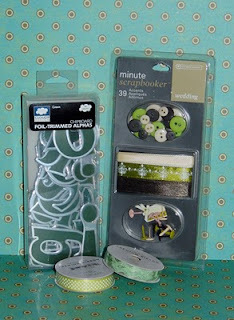 Check out this fun St. Patricks Day Blog hop hosted by Giselle at: crossmyheartpapercrafts.blogspot.com and Nadia at: nadia's beautiful mess. There's still time to get in on the hop and maybe win some great candy! So, if you get a chance...check it out. You will see some really great projects and be inspired by all the ideas and techniques showcased! Just click on the picture of the Lucky Pot 'o Gold to go to the beginning of the Hop. I'm really getting some experience making Thank-you cards now! As I mentioned in my last post, over the last month I've been fortunate enough to win a few blog hops, so today I am showing you another Thank-you card I have made to send to one of those wonderful bloggers who gave me a gift! 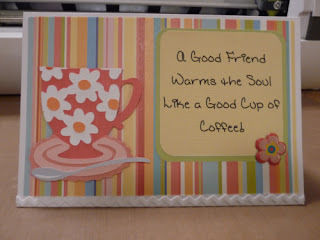 I made this card for Cricut Chick (Julie) who was having a great giveaway for when her blog: http://www.cricutchick.blogspot.com reached 1000 visitors. 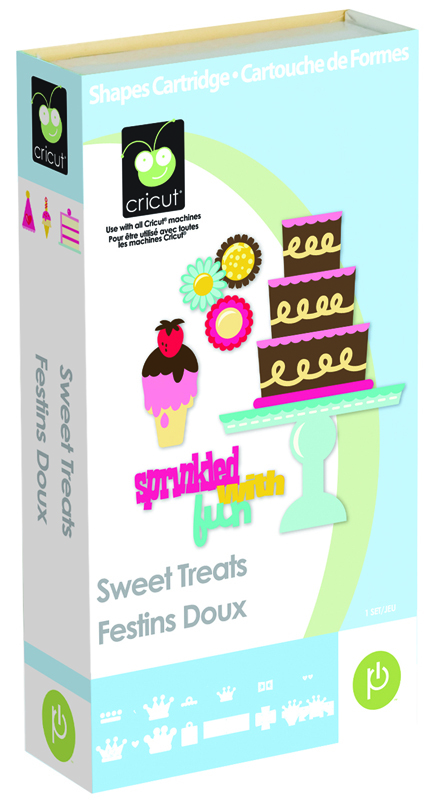 The Cricut Sweet Treats Cartridge! I was pretty happy about that...as I didn't have this one and had been wanting it for awhile. 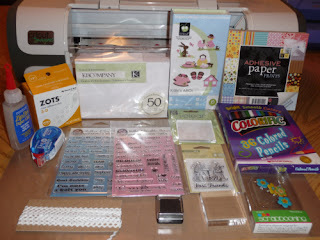 So, I just want to say a very big "Thank-you" to Julie (Cricut Chick) for being so generous in her giveaway, it is very much apprectiated! 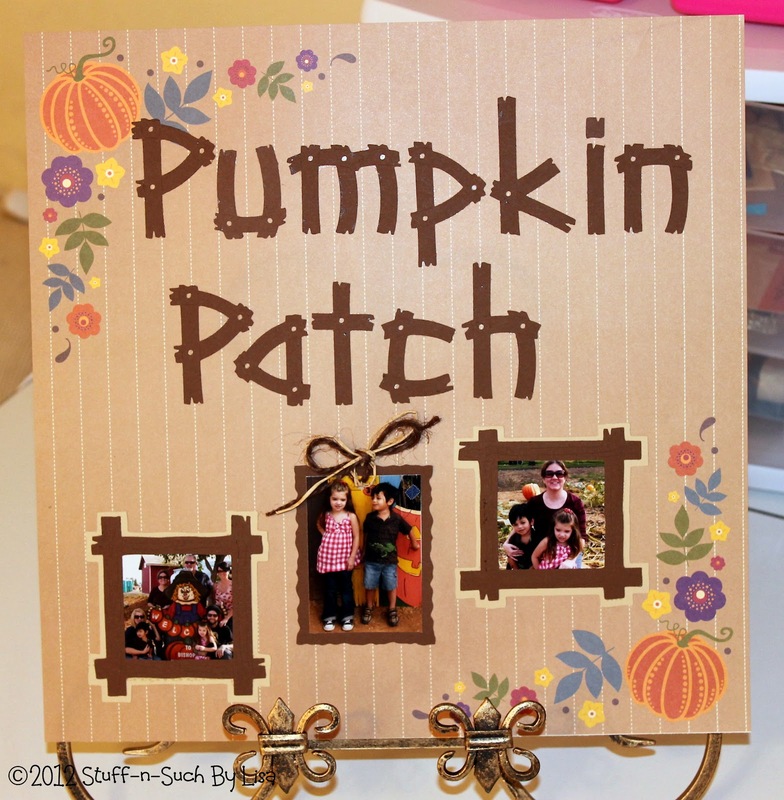 Check out her blog if you get a chance, it's full of beautiful projects and great inspiration. If you like what you see...please follow me! I have been blessed to win a few great items (blog candy) on some blog hops lately and I wanted to say Thank-you to all of the bloggers who treated me to their great candy! This card is the first one I have completed (It's still taking me awhile to finish cards!). 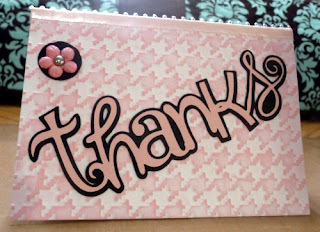 I am sending this thank-you to the awesome Star at Stars Paper Passion Blog. 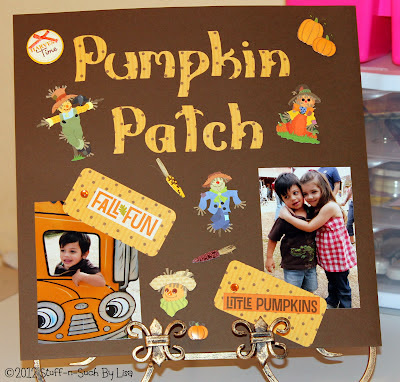 This blog hop was a lot of fun because the projects were all done by children! There really were some great projects that showed so much wonderful creativity and talent! Even though the blog hop is over, if you'd like to check out some of the adorable projects, just click here and you can follow the list of blog sites and see them all. 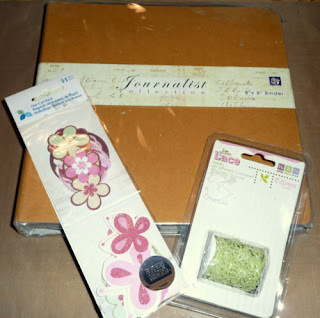 I was fortunate to be the winner of Star's blog candy and this is what I won! I was very excited about this, as I have been wanting these for a long time! 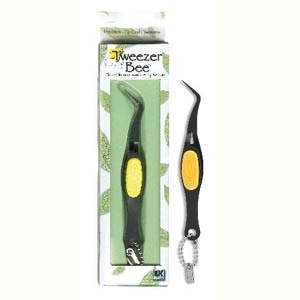 They are perfect for picking up those very tiny pieces when you are layering something small. I cannot tell you how many times I have lost those tiny pieces because I can't get a good grip on them with my fingers and they fly out of my hand and into the vast unknown black hole...never to be found again! I want to Thank Star and her 3 children who participated in the hop and created such cute projects! Check out my craft haul from Oozak.com, my first purchase of Copic Pens. Many thanks to all the digital stampers and Card makers out there that have been inspiring me to take the Copic Leap. Especially Drew Michael, from Drew Michael Designs, a very talented young man and entrepreneur. Check out his blog: www.scrappyhappiness.com and you will be amazed! I apologize for the bad audio at the start of this video. This is my first stab at a blog video and I wasn't sure how to set up the camera and acoustics...so I just went with it and this is what I got! I'm not an expert...that's pretty evident...LOL! Leave me a comment and let me know if you've tried Copics or any other brand of coloring marker and let me know what you think about them. 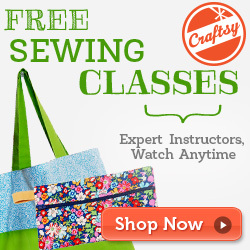 Fantastic Giveaway on March 17th at Hoo's Crafty! Another Great Giveaway! 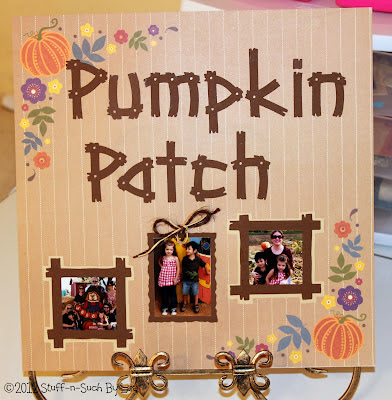 Check-out Liza's Blog - Hoo's Crafty! for a chance to win this great blog candy! I am still working on my most recent project and have not finished so I can't post about it yet, but i thought I'd post some layouts I did in November last year while at a crop with my friend Melissa. Hubby and I had just taken two of our Grandchildren to the local Pumpkin Farm/Patch (Bishop's Pumpkin Farm, Wheatland, California) as we try to do every year. I just love that time of year...all the beautiful colors of Autumn are my favorite and the weather here is usually fairly mild. 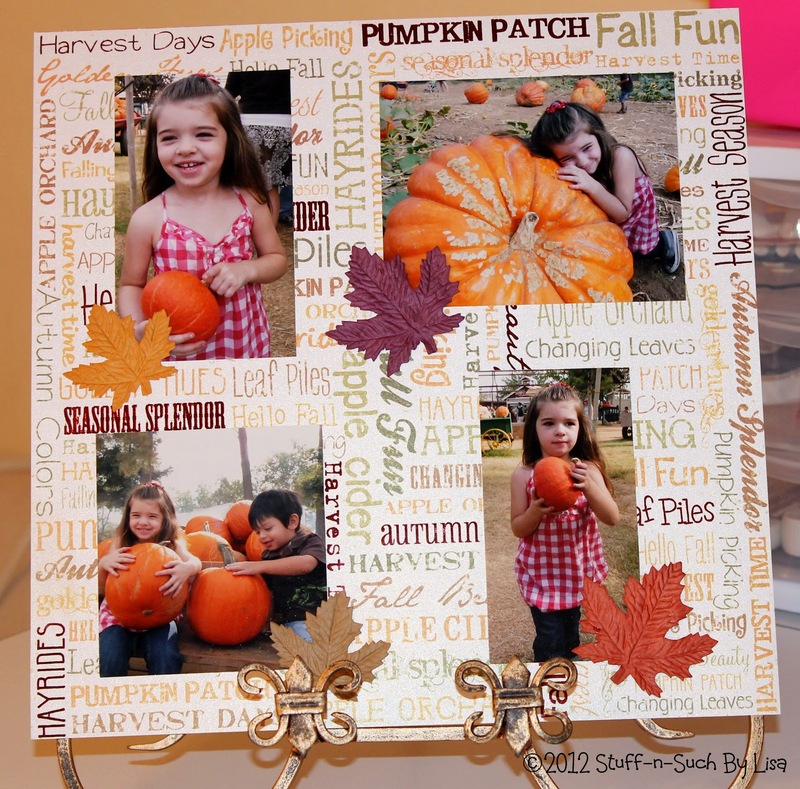 Fun at the Pumpkin Patch! Autumn Fun with Poppy & Gigi! The 12x12 paper was purchased at Green Tangerine's where we were at the crop. 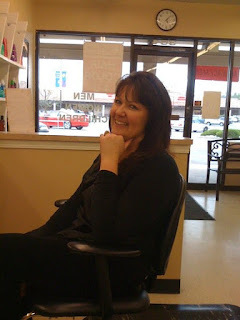 It is an awesome scrapbooking store in Rocklin, California with all kinds of neat goodies and two HUGE scrapbooking rooms for crops. I have not added any journaling to these yet, as journaling is always hard for me for some reason...I just never know where to put it and I feel like I don't write my feelings down well, like that it would sound corny or not proper. I have to get over that and just let my creative thoughts and emotions flow! I guess for me...the photos are the big part. I've always been a big fan of photos and have been carrying a camera with me since about the 6th grade! I know the emotions I feel when I look at the photos, I just have a hard time writing it down for some reason. Maybe some of you out there in scrapbook land can help me with this...what do you do to help move your thoughts along while journaling? Thanks for looking and if you like what you see...will you please follow me? Click on the link or pictures to get more details. Whew! Finished another card...took me awhile, but I was a little bit faster this time, so I'm hoping with each additional one I will get faster! 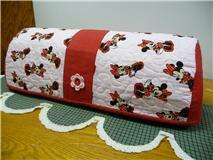 Hubby was getting tickled that at 4:00 am this morning I was still working on it. He probably wonders why I don't just go and buy one...but he knows how much I love to "create", so I'm sure he's figured out my insanity! 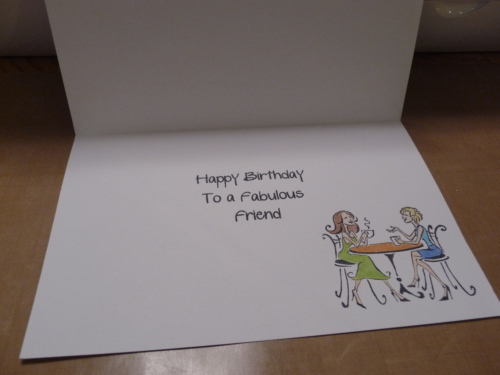 This card is a special one because I made it for my dear friend Melissa who's Birthday is today. Thank-you for being such a good friend to me and always being there when I needed someone. This card was supposed to be finished yesterday, so that I could mail it to her (she lives about an hour away from me) or take it to her, but...as usual, I struggled over all the little details and it took me longer than expected. So, my blog followers will see it before the recipient...though I think I will e-mail her a link to my blog so she can see it on her Birthday! Kokuyo Dot 'n' Roller Adhesive, 1/3"
I used a pre-made, white, blank card from K & Company and placed a 4 x 6 piece of patterned adhesive paper on the front. I glued down a piece of rick-rack on the bottom edge of the front of the card. I cut-out the teacup on page 35 of the Kate's ABC's cartridge, using my Imagine and colored cardstock. For the sentiment background on the front of the card I cut out the square shape with rounded corners (included on the Imagine machine) at 3.0" and a smaller one at 2.8", using textured white cardstock and used the color printer feature of the Imagine to color these squares just to make things a bit faster. The sentiment was something I just came up with, because thinking of my friend Melissa reminded me of a time when we went and had coffee together when I needed a shoulder to cry on and she was there for me! I printed the sentiment in Microsoft Word using the Catholic Schoolgirls Intl. BB Font. I first printed the sentiment on plain printer paper in my Lexmark X4975 Printer, then lined it up with the cut out sheet I had left over from cutting out the square shapes. When I had it lined up properly, I put a piece of white cardstock on my Cricut mat and printed the two squares in color, but did not cut them yet. Then I placed that same piece of cardstock in my printer and printed the sentiment onto the square, placed it back into the Imagine and then cut it out. This took a little trial and error before I got it just right, but I didn't have to waste any good card stock to do it, just a few sheets of cheap printer paper! This may sound a bit confusing, but what I did basically was cut out two sets of the squares, one to act as a "template" to set-up the sentiment in MS Word and one that was actually used for the card. 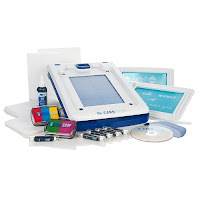 It would be better if I did a video for this, but I know many other Cricut-teers out there in YouTube land have done videos explaining this, so I didn't want to be too repetitive. 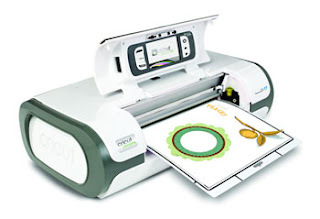 I will try to find one that explains this and link it here...it's basically a way to make any Cricut machine perform like an imagine. I added one final piece of "bling" (which I agonized for hours over whether I should or not!) to the corner of the sentiment...a metal flower brad. Okay, for the Inside of the card I used some very cute stamps from Joy's Life to stamp the sentiment and a mini-stamp from Studio 112 of two girls drinking coffee for the corner accent. I decided to color the stamp to give the inside of the card a pop of color...it seemed a bit bland without some color. Hope you liked the card and thanks for stopping by! 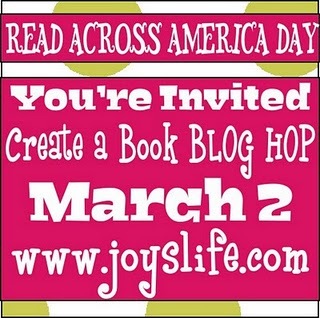 In honor of Read Across America Day, my Crafty Blog Friend Joy is hosting a awesome blog with very talented crafters & some great blog candy! Well, we had the baby shower for my DIL this past Saturday and it turned out so nice!! Thanks to K and her Sister S! They are both so creative. K made an adorable owl and mushroom banner out of felt, ribbon and buttons. I gave my owl card and big sister t-shirt to my sweet granddaughter B and she loved them both! This made her Gigi (me) VERY happy! Sweet Orange Luxurious Hand Soap and Green Tea Soap packaged in an adorable book container, with two color coordinated wash cloths! I'm not sure where they purchased these, so the links above just take you to the manufacturer's sites. They smell wonderful, I will have to find out where to get more! I just love bath stuff, so I was pretty excited! Scrappin' with Cricut 200 Follower Giveaway! Check out this awesome blog candy from Scrappin' with Cricut!